Thank you to The Beef Checkoff for sponsoring this post. I grew up in southern Germany and then spent my mid-teens through young adulthood in England. What do the two countries have in common? This: Hardly anyone knows anything about Mexican food. It’s true. I’m grateful for a mom who is a terrific international cook and regularly included Mexican dishes in her cooking repertoire. But finding a Mexican restaurant was next to impossible until the last few years. That’s been sloooowly changing, but it makes sense that no country outside of Mexico has adopted Mexican food to the extent as the United States. I did actually find one good Mexican restaurant in Germany; in fact it was only one of two I had ever even come across in all those years between Germany and England. But that restaurant in Germany made Mexican food that was every bit as good as the stuff I was introduced to when I moved to the U.S. twelve years ago. And a favorite dish of mine to order there was the grilled fajitas. You could smell the food cooking on the grill from down the street as you were approaching the restaurant on summer evenings with your window rolled down. On weekends nights there would be a long line of people waiting outside for a table. The fajitas would come to the table, still sizzling on cast iron platters; a generous mound of tender and perfectly seasoned steak next to multi-colored charred peppers and onions that still retained just the right amount of crispiness. Warm flour tortillas, made right there at the restaurant, were placed next to the platters with a variety of toppings. No one could resist digging in immediately. So where did fajitas originate anyway? In Mexico? The United States? Well, it’s actually a little of both. Fajitas are a popular Tex-Mex dish and though the great Lonestar State of Texas would love to lay to claim them, they were actually invented in the 1930’s by Mexican ranch workers (aka, vaqueros, or “cowboys”) living in West Texas along the Rio Grande on the Texas-Mexico border. The story goes that part of their wages came in the of beef. And by that I don’t mean filet mignon. When the steers were butchered it was the least desirable, toughest cuts and scraps of beef that went to the workers. These “rejects” included skirt steak and these Mexican cowboys found a way to make delicious use of it by marinating and grilling it and then eating it wrapped up in tortillas. Remaining relatively unknown for decades to anyone but the vaqueros and their families, fajitas suddenly leapt out from obscurity into the public spotlight in 1969 when a meat market manager from Austin, Sonny Falcon, opened up the very first commercial fajita concession stand. From there several restaurants started serving fajitas and the rest is history. 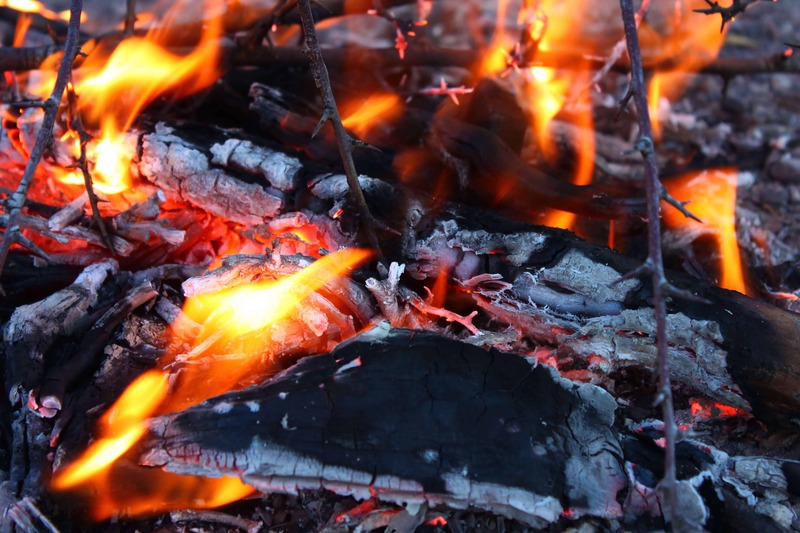 What began as the humble campfire dinners of Mexican ranch workers are now one of the most popular Tex-Mex dishes in America. Though traditionally fajitas were made with skirt steak, fajitas have become so popular over the decades that now many different cuts and types of meat are used. Today we’re making them with veal. Veal is prized among chefs worldwide for its versatility, delicate flavor and tender melt-in-you-mouth texture. It also has a lower fat and calorie profile than beef. The USDA recently revealed that a 3 oz. serving of cooked, trimmed veal provides less than 10% of the calories recommended for a 2,000 calorie diet while simultaneously providing more than 10% of the daily values for protein, niacin, zinc and vitamins B-12 and B-6. For more information about veal along with a ton of great recipes, visit Veal Made Easy. I only buy my veal from stores who source their veal from farmers who raise their calves in pastures and group housing. Check with your butcher to find out. Depending on where you live it can also be difficult to find cuts of veal other than scallopini (super thin) and ground. Often though the butchers cut the scallopini themselves and if you ask them to, they’ll be happy to cut you some steaks instead. 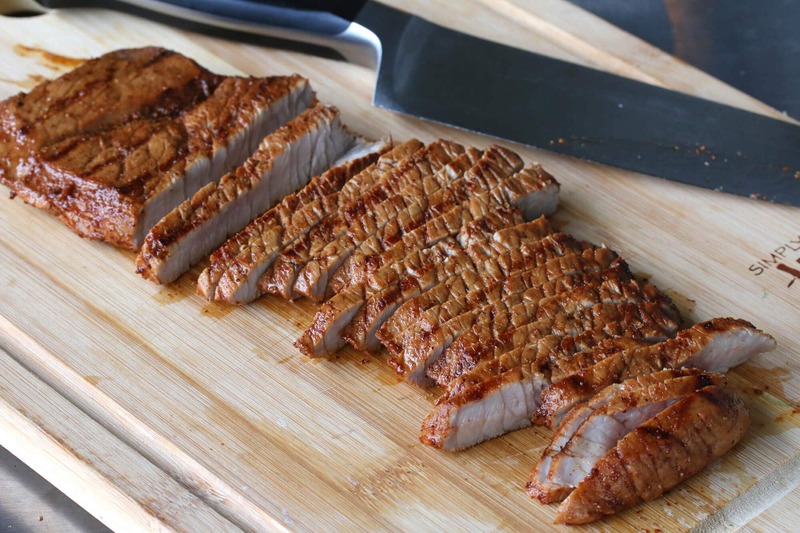 The veal steaks are marinated and grilled, seared briefly over high heat to seal in their juices and get those flavor-boosting caramelized grill marks. 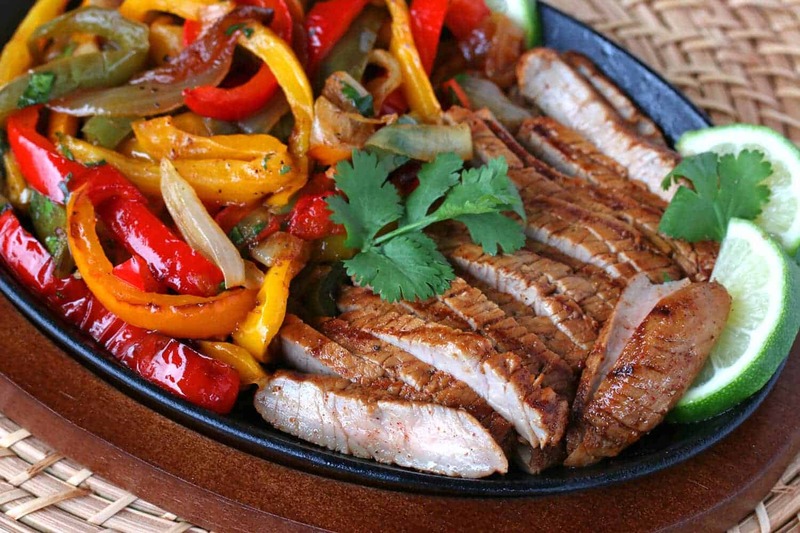 The flavor and tender texture of the marinated grilled steaks, crispy seared onions and peppers, combined with your favorite fajita toppings makes this dish thoroughly irresistible! Whisk together the marinade ingredients in a bowl and then pour it into a ziplock bag with the steaks. Massage the steaks to evenly coat them and refrigerate them for 2 hours or up to overnight. Reserve the marinade (you’ll be adding it to the veggies later). You’ll need about 3 large bell peppers. 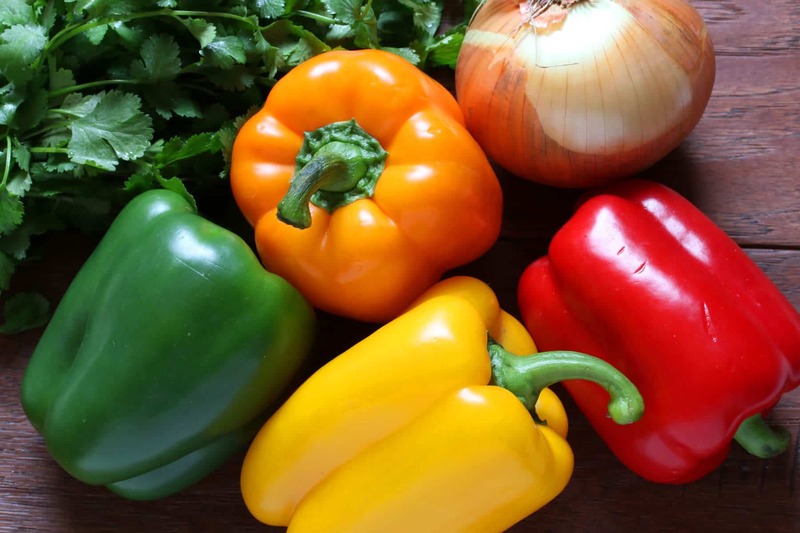 I’m using a red and green bell pepper and half of an orange and yellow pepper for color variety. 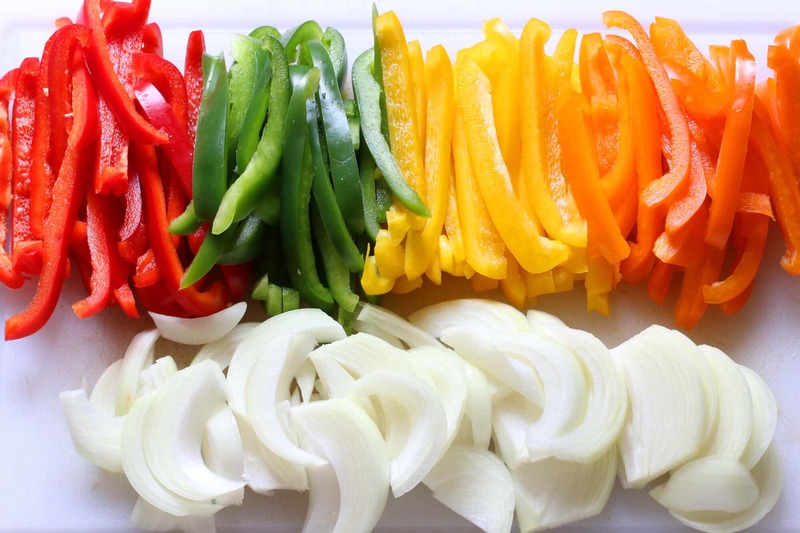 Slice the peppers and onions into thin strips. Chop the cilantro. Heat the grill and place a cast iron skillet for the vegetables on the opposite side of the grill over indirect heat to begin warming while you grill the steaks. Place the steaks over high, direct heat and briefly sear on both sides for 1-2 minutes (depending on thickness of cut), turning at a 45 degree angle to create grill marks. You can use an instant read thermometer for doneness: For medium-rare it’s 115-120 degrees F, for medium it’s 125-130 degrees F. Transfer the steaks to a plate and tent with aluminum foil for 10 minutes while you cook the vegetables. Using a grilling mitt, move the cast iron skillet over direct high heat. Add some oil, add the vegetables and sear them, stirring every 90 seconds or so for 5-6 minutes total or until very lightly charred and so they’re still a little crisp. Add salt, pepper, cilantro and pour in the reserved marinade. Stir to combine and cook for another minute or two. Remove from heat. Using a sharp knife, thinly slice the steaks across the grain. To serve, place the strips of steak and the vegetables on a hot cast iron fajita serving platter with some lime wedges and garnish with sprigs of fresh cilantro. To assemble the fajitas, place some steak on the warmed tortillas followed by the toppings of your choice. Serve immediately. Watch the video below to see how we made these fajitas from start to finish! Whisk together the marinade ingredients. Place the veal steaks in a ziplock bag and pour in the marinade, massaging the steaks to evenly distribute the marinade. 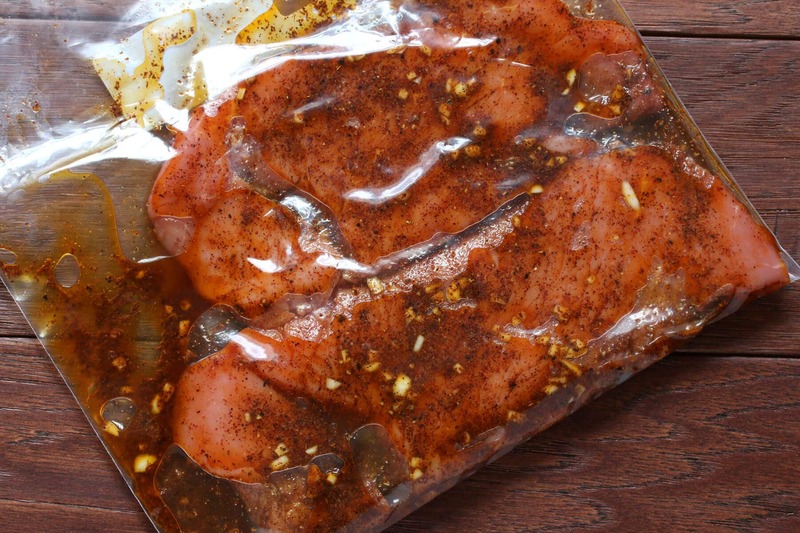 Marinate in the fridge for at least 3 hours or overnight. Reserve the marinade. Heat the grill and place a cast iron skillet for the vegetables on the opposite side of the grill over indirect heat to begin warming. 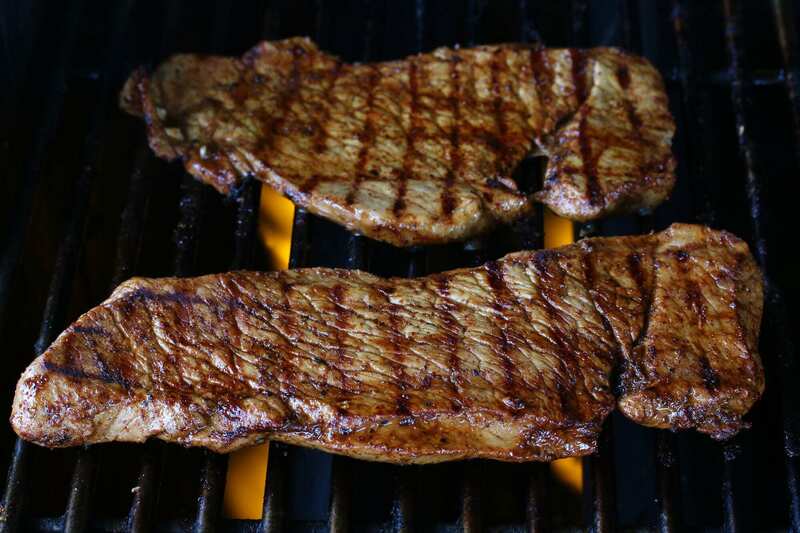 Place the steaks over high, direct heat and briefly sear on both sides for 1-2 minutes (depending on thickness of cut), turning at a 45 degree angle to create grill marks. You can use an instant read thermometer for doneness: For medium-rare it's 115-120 degrees F, for medium it's 125-130 degrees F. Transfer the steaks to a plate and tent with aluminum foil for 10 minutes while you cook the vegetables. Using a grilling mitt, move the cast iron skillet over direct high heat. Add some oil, add the vegetables and sear them, stirring every 90 seconds or so for 5-6 minutes total or until very lightly charred and so they're still a little crisp. Add salt, pepper, cilantro and pour in the reserved marinade. Stir to combine and cook for another minute or two. Remove from heat. Slice the steaks across the grain. Arrange the steak strips and the vegetables on cast iron serving platters with some lime wedges and garnish with fresh cilantro. Thank you to The Beef Checkoff for sponsoring this post! Mmmmmm! Fajitas are one of my family favorites. Although we’ve never done grilled veal before. Now that summer is coming it is the perfect time to start grilling. 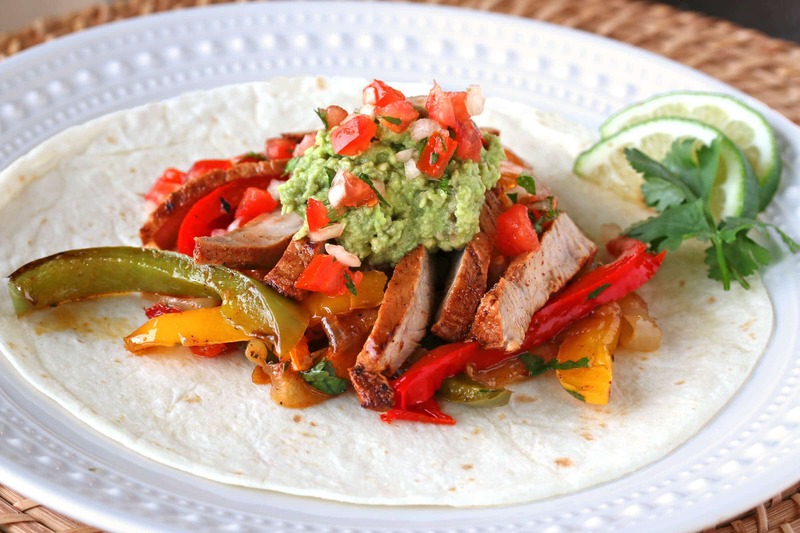 I love fajitas – one of our favorite meals! These are gorgeous! I could eat them several days a week and still want them! 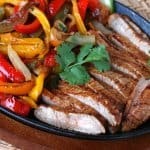 These fajitas look seriously amazing! 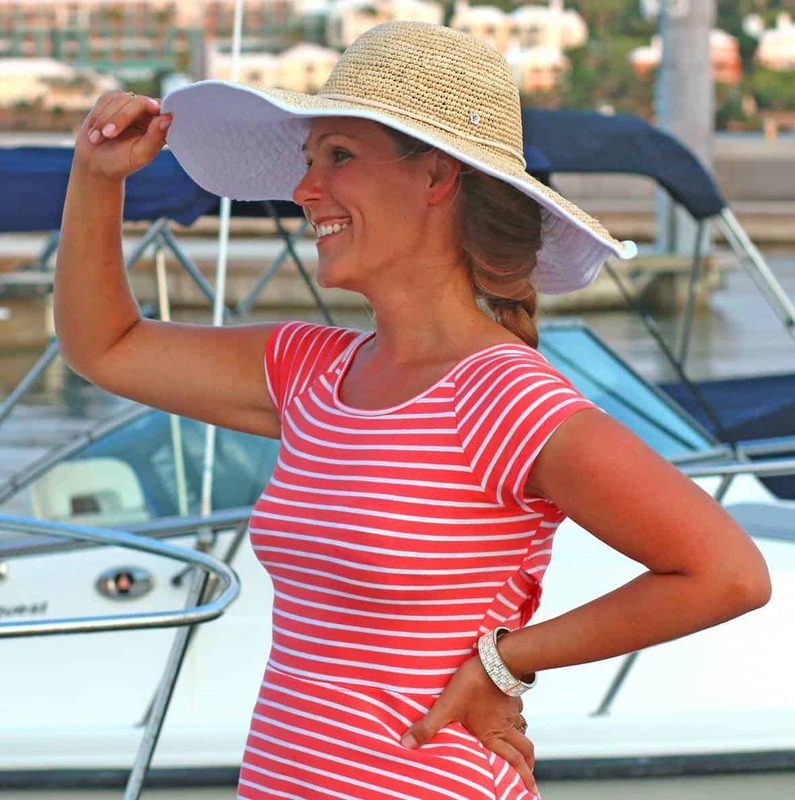 One of our faves! I’ve never made them with veal before but I know my carnivore of a husband will definitely approve of this change! I loooove veal! I’ve never thought to make fajitas with it but that sounds absolutely amazing, I’m looking forward to trying it! I love fajitas and this marinade looks incredible! My family loves fajitas, and I can’t wait to try your recipe! Give me this! I can’t wait to try it! I’m a huge fan of fajitas of all kinds, so long as they are well seasoned and come with a ton of veggies. Your recipe looks very flavorful. I’ll definitely have to try them with veal. These fajitas look amaaazing!! I can’t wait to try this!! We don’t eat much veal, but now I’m hungry for veal fajitas! They look great! Fajitas are so good, aren’t they! I just had chicken fajitas the other day for lunch and now I’m craving these steak fajitas. I loved learning the history of where fajitas originated! Can’t wait to try this! Love fajitas! I had no idea of the humble Tex-Mex beginning. Now everyone can enjoy fajitas at home! That meat looks perfectly seasoned. That’s always my pet peeve with fajitas is getting that meat just right.